ThoughtFarmer helped Sonny's BBQ share news, capture knowledge, and connect franchisees across locations. Sonny’s faced a lot of challenges typically associated with a franchise model of business. They struggled to ensure their brand and vision were consistent across every franchisee location. They had no way of appreciating and recognizing the valuable contributions of their employees. 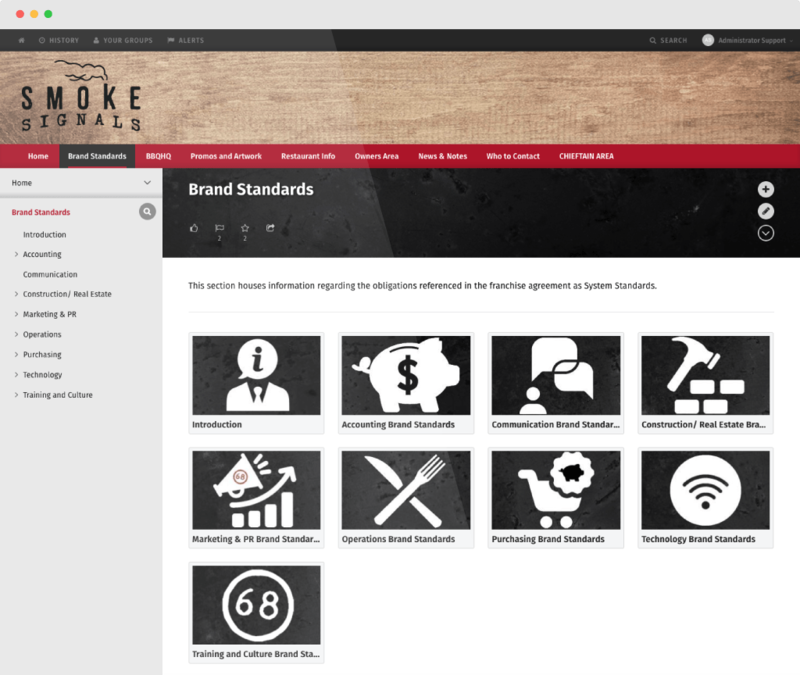 Heather Kruskamp, a training manager at Sonny’s BBQ head office, had long recognized the need for a platform that unified their communication across their franchisee locations. Heather experimented with a few different tools and platforms—including a wiki-like solution, but was dissatisfied as she felt it didn’t meet their communication needs. “The navigation was confusing, messaging was getting lost, the layout was poor, and it was not user friendly,” said Heather. “It was frustrating because passwords needed to be reset over and over again, which was time consuming”. There was also limited reporting, which meant that Heather had no way of knowing who logged in and who hadn’t. If the lengthy process had a positive side, it was that it was helping Heather understand what she needed and wanted from an intranet, and what she didn’t. 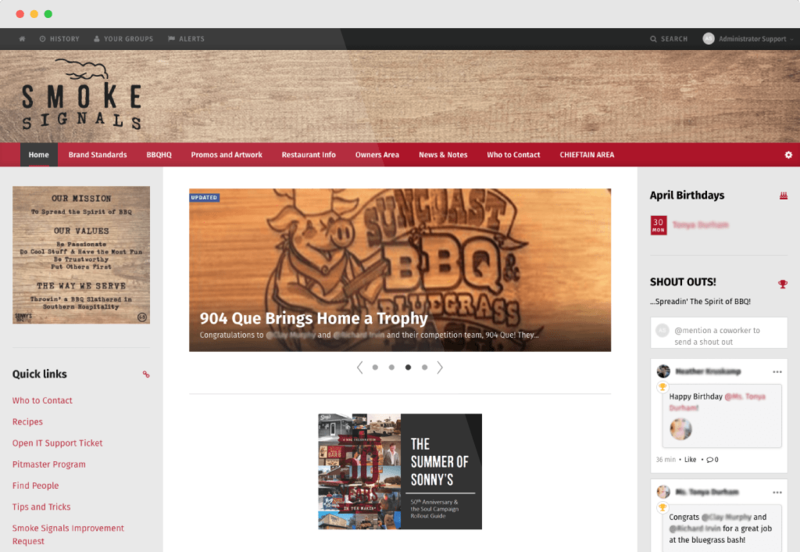 The goal was to find an intranet that helped improve communication, both within the head office (BBQHQ) and with the franchisees who are dependent on information from the top. The chosen solution would also need to deliver an easy end-user experience with the ability to search for people and content. With help from IT Manager, Joshua Gravely, Heather continued her search for intranet software, and quickly discovered ThoughtFarmer. They were immediately impressed by everything ThoughtFarmer offered. ThoughtFarmer’s Shout-out feature enabled Sonny’s BBQ to recognize their employees for their hard work and success. “Our employees definitely feel more appreciated than they did before,” raved Heather. 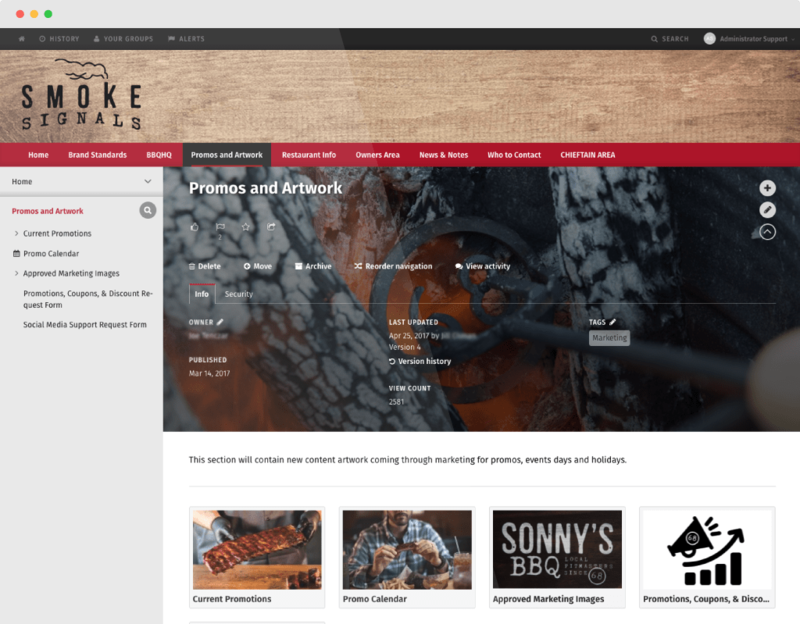 ThoughtFarmer helped Sonny’s BBQ create a secure, scalable repository where all their franchisees could locate accurate, up-to-date information about the Sonny’s BBQ brand. Things like recipes, or important policies are now easier for everyone to access. ThoughtFarmer’s customizable navigation and dynamic org chart makes it easy for Heather and others to find and locate employees, as well as important documents. ThoughtFarmer’s ongoing support through the Customer Success team meant that Josh and Heather were never on their own.“Support has been amazing, and I have never felt that any issue wasn’t addressed,” beamed Heather.